Whether your income is $25,000 or $250,000, you have the same tremendous opportunity with your children. You get to help them shape their worldview as they wrestle with topics like entitlement, gratefulness, greed, and contentment. It’s not always easy, but gratitude lessons can sprout up from everyday moments, as we’ll see in today’s article. Little conversations about money, life, and more can become common place on car rides, around the dinner table, or before lights out at night. So here are a few conversation starters for you and your child. 1. Show them what they have. One powerful way to help your children understand how much work goes into the things they own is to show them. For example, pay for your groceries in cash the next time you’re all at the grocery store. Let them see the 50’s or 100’s you hand over to the cashier in exchange for your next week or two of meals. Show them how you choose a product (i.e. whether it’s on sale, you have a coupon for it, etc.). Talk about why you don’t spend a great deal on certain products or why you’ve cut back on others. Encourage your children to ask questions on the drive home. If they’re old enough to understand, talk about how many hours it took you or your significant other to work in order to pay for a month’s worth of food. 2. Be consistent with your “No” and explain why it can be a good thing. For example, I recently won a large container of Tootsie Rolls in a guessing game at a family reunion. My 2-year-old knows they’re in the house, so he drew a simple conclucsion: Chocolate candy for breakfast. Every morning. The Buddy the Elf diet isn’t going to cut it. It’s the same with saying no to other things in your kids’ lives. Sticking with your answer – however difficult – will give them a healthy dose of boundaries if you also take the necessary time to explain your reasons. Sometimes, you can offer a positive alternative without giving in. If they want candy for breakfast, my answer could be “No, but if you finish your breakfast, you may have one later as a snack.” If my daughter is fixated on a new toy she can’t have, that gives us the chance to talk the cost of toys. We can discuss bringing some of her own money next time – or doing chores to earn enough for that item. OR just stick with your answer. You don’t owe your kids a Disney experience at the store or the breakfast table. 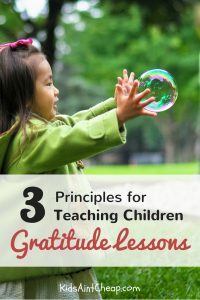 Gratitude lessons can feel harsh, but, like I said, they can produce some terrific discussion opportunities between you and your child. 3. Show them how others live with less. One way to really generate discussions about gratitude versus entitlement is to take your kids to a homeless shelter or soup kitchen. Hunger and poverty are so prevalent around the world. Children in stable living conditions don’t grow up understanding how other children suffer each day – unless someone shows them. For example, Audra Rogers from Real Honest Mom did a brave thing for her 8-year-old son. After noticing a few cases of what she called “affluenza” in her son (acting entitled or ungrateful for having a lot of things), she loaded him into the car and spent the day serving in a homeless shelter. Their experience was so powerful that Disney’s parenting blog, Babble, picked up Audra’s story and published it for other families to see. You can teach your kids about gratitude through experiences, conversation, books, and the like. I believe, however, the most effective gratitude lessons are simply taught by example. Easier said than done, I know, but the struggle yields a tremendous return: Children who love and appreciate the world in which they live. When did you begin to understand gratitude as a child? Share an example in the comments below.